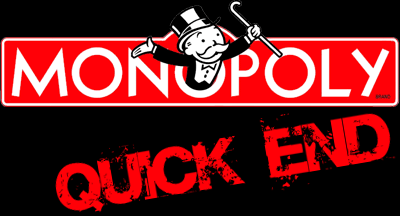 This method will quickly end a game of monopoly while keeping the integrity of the game intact. Upon consensus to end the game each players piece is moved to the GO space. Then each player rolls one dice, the player with the lowest roll will go first, from here on out all of the all of game rules come back into play. The first person to make it around the board back to the GO space wins. The advantage of finishing the game this way becomes evident when you analyze the method. Moving around the entire board equalized the game to what would happen if the game were to play out, meaning the player with the most property is most likely to win, but there is still a chance that any player could win. My experience with this ending is that it happens quickly, encourages a lot of interesting property trade, and most importantly the progress that each player has made thus far in the game helps their chances in winning.